Wimbledon, England (CNN) Compared to Friday, there wasn’t much drama in Serena Williams’ match against older sister Venus Williams at Wimbledon. But if that disappointed the neutral in the siblings’ 26th meeting and first at a grand slam in six years, the world No. 1 surely didn’t mind. That’s because Serena remains on course for the “Serena Slam” and calendar-year grand slam after defeating Venus 6-4 6-3 at Center Court. Drama didn’t lack, though, in Novak Djokovic’s tussle with Kevin Anderson on Manic Monday — when all 32 players remaining in singles are scheduled to play. The men’s No. 1 will have to contest a fifth set Tuesday against the towering South African after darkness halted proceedings shortly before 9 p.m. local time in southwest London. Anderson edged the first two sets 7-6 (8-6) 7-6 (8-6), with Djokovic taking the next two 6-1 6-4. As Serena predicted after her nervy victory over home hope Heather Watson in the third round — when she was two points away from exiting — those watching inside tennis’ most famous arena made Venus the crowd favorite. One can understand why. Venus is seemingly closer to the end of her career than Serena at the age of 35, was the underdog and is a past champion at Wimbledon, owning five titles — like her sister. But Serena set the tone quickly to dampen their spirits on the court where they have enjoyed so much success, storming to the first eight points. “I knew that playing someone like Venus that’s beaten me the most, I have to be solid,” Serena told reporters. “I had to cut down on my unforced errors. I had to take a lot of chances. She was indeed. While Venus can’t match the plucky Watson’s retrieving skills — Serena thus didn’t have to hit as many balls — the 20-time grand slam champion was clearly sharper in all facets of her game. She produced 10 aces without a double fault, 36 winners and made a mere 13 unforced errors. When the pair embarked on baseline rallies, Serena was the far superior, tallying 21 winners to Venus’ eight. And just as she began the encounter, Serena ended it in style, capturing eight of the final nine points. They hugged at the net and there were no hard feelings. 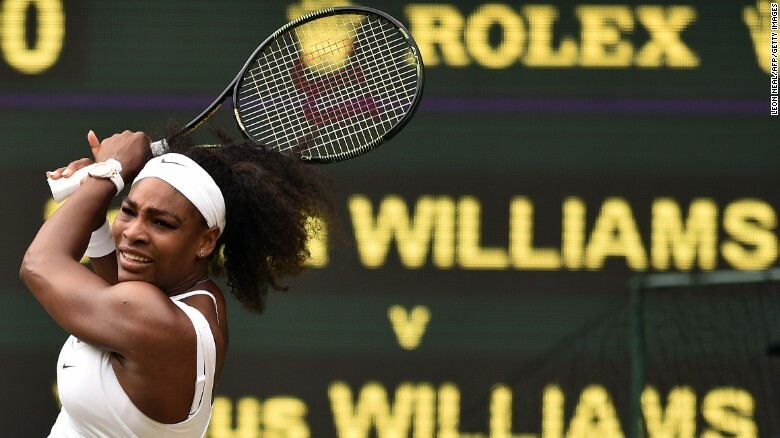 Serena now leads Venus 15-11 in their duels and holds an 8-5 advantage at majors. Awaiting Serena in the quarterfinals is former No. 1 Victoria Azarenka, who beat young Swiss Belinda Bencic 6-2 6-3. “I look forward to tomorrow. I feel like my tournament has finally begun. This is where I feel really comfortable in a grand slam,” said Serena, who has won nine of her last 10 quarterfinals at majors. Azarenka twice tested Serena recently, manufacturing three match points in Madrid in May and leading by a set and break in their ill-tempered French Open clash. But both times Azarenka lost. Maria Sharapova, meanwhile, achieved her first quarterfinal at Wimbledon since 2011 when the Russian downed Kazakhstan’s Zarina Diyas 6-4 6-4 and next faces big-serving American CoCo Vandeweghe, who upset French Open finalist Lucie Safarova 7-6 (7-1) 7-6 (7-4) to land in a maiden grand slam quarterfinal. Garbine Muguruza — who ousted Serena last year at Roland Garros — knocked out another former No. 1, Caroline Wozniacki, 6-4 6-4 to set up a pairing with French Open semifinalist Timea Bacsinszky, a 1-6 7-5 6-2 winner over Monica Niculescu. Agnieszka Radwanska, the suddenly resurgent 2012 finalist, beat Jelena Jankovic — who had sent defending champion Petra Kvitova packing Saturday — 7-5 6-4. Joining Serena and Vandeweghe in the last eight is a third American, Madison Keys. The Australian Open semifinalist — who leads the women’s tournament in aces — rallied for a 3-6 6-4 6-1 win against Belorussian qualifier Olga Govortsova. Djokovic is bidding to win a third Wimbledon title overall to match his coach Boris Becker and even if Anderson reached the final of a Wimbledon warmup in London last month, the numbers suggested the Serb would progress without plenty of fuss. He’d won four in a row against Anderson without giving his foe a set. Yet Anderson thrived on serve in the first two sets, when he struck 22 of his 32 aces. He overturned a 4-1 deficit in the second-set tiebreak. Djokovic raised his level, Anderson lost sting on his serve and it’s the 14th seed who would have been happier to have play stopped. Manic Monday lived up to its billing for Nick Kyrgios who put in another controversial performance in defeat to France’s Richard Gasquet. After bouncing his racket into the crowd and contravening Wimbledon’s dress code in the third round, Kyrgios found himself in hot water again with the umpire after swearing during the second game of the second set against the 21st seed. Things then took a bizarre turn in the next game as the Aussie appeared to give up almost entirely — hitting half-hearted returns and not even attempting to return another of Gasquet’s serves. Kyrgios regrouped and took the third set, saving two match points after fending off nine when the players met last year at Wimbledon. But he lost out in a fourth set tiebreak, double faulting to gift Gasquet the match 7-5 6-1 6-7 (7-9) 7-6 (8-6) and a quarterfinal with Stan Wawrinka. Elsewhere in men’s action, Andy Murray conceded a set for the second straight match but the 2013 champion had enough to beat Ivo Karlovic 7-6 (9-7) 6-4 5-7 6-4 despite the Croat pummeling 29 aces. The 6-foot-11 Karlovic, second in career aces, led the tiebreak 4-2 only to see the Scot win the opener on his seventh set point. French Open winner Wawrinka is yet to drop a set following his 7-6 (7-3) 7-6 (9-7) 6-4 victory over David Goffin while his more famous Swiss, Roger Federer, crushed Roberto Bautista Agut in under 90 minutes, 6-2 6-2 6-3. The seven-time champion’s reward is a match with Gilles Simon; Simon thumped 2010 finalist Tomas Berdych 6-3 6-3 6-2. Milos Raonic and Eugenie Bouchard made quick exits this year at Wimbledon after making the semifinals and final, respectively, in 2014 but Vasek Pospisil has picked up the slack for Canada. Pospisil — last year’s doubles champion alongside American Jack Sock — rallied from two sets down to overcome Viktor Troicki 4-6 6-7 (4-7) 6-4 6-3 6-3 two days after seeing off British wildcard James Ward 8-6 in the fifth. He only faced one break point. Pospisil, later a loser in doubles with Sock, battles Murray on Wednesday. The winner of Djokovic-Anderson plays U.S. Open champion Marin Cilic, who has quietly advanced in the draw. Cilic, troubled by injury for much of 2015, beat U.S. wildcard Denis Kudla 6-4 4-6 6-3 7-5.